This might be the best four-door performance car on sale right now. It’s fair to say that I’d been looking forward to getting behind the wheel of the Alfa Romeo Giulia Quadrifoglio for some time. The brand’s new flagship sedan is a $72,000, 505hp (377kW) rear-wheel drive statement of intent, a car that says to rivals at BMW and Mercedes and Cadillac that the Italians are back. It first caught our attention at the 2015 Frankfurt Motor Show, then again in Los Angeles. 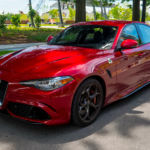 Last year, the Giulia Quadrifoglio teased us some more in New York 2016 and then once again this year when we awarded it Best New Luxury Car. But a build-up like that can be risky. Cars don’t always meet our expectations, and there’s little worse than the feeling when you fail to gel with a car you’ve been looking forward to driving. 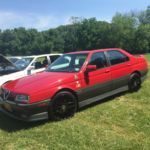 A man on a TV show once said something along the lines of “you can’t consider yourself a true petrolhead until you’ve had an Alfa Romeo.” At the time, I wasn’t entirely sure what he was talking about. 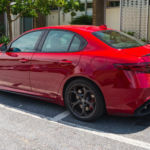 The Alfas that populated the roads during my early driving years in the 1990s were unremarkable and badly compromised. During the 2000s, they were pretty but almost exclusively front-driven. And the Giulietta rental car I crossed Europe in a few years back had the most amazingly uncomfortable driving seat I’d ever encountered. Well, forget all thatif the new Giulia Quadrifoglio is anything to go by, the brand is back. I’ll go one further: if Ferrari were going to build a rival to the BMW M3, it would be this car. The new Giulia Quadrifoglio is just wonderful. 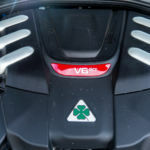 Ferrari is no longer owned by the same Fiat Chrysler Automobiles parent company as Alfa Romeo, but there is more than a little evidence of close familial links between the cars that wear the prancing horse badge and this Alfa with its (hand-enameled) four leaf clovers. Like the engine. It’s an all-aluminum 90-degree, twin-turbo 2.9L V6 with direct injection and even cylinder deactivation for better performance and economy. 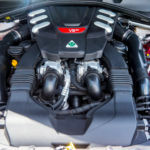 The engine is also extremely similar to the all-aluminum, 90-degree, twin-turbo 3.8L V8s (codenamed F154) you’d find powering a Ferrari 488 or California T. That’s not a bad thing at all. The 2017 Alfa Romeo Giulia Quadrifoglio. Probably the best car we’ve driven all year. The badge on the front says Alfa, but some of the engineeringand some of its charactercomes from Ferrari. Oh, and that carbon fiber front splitter? It drops down at speed to add downforce. The rear is dominated by a large diffuser and four fat exhaust pipes. To my eyes, there isn’t a bad angle on this car. The Giulia Quadrifoglio’s cabin. The ergonomics are good, the fit and finish acceptable, and it fizzes with excitement. Or maybe that’s just a lack of NVH. No full-width LCD here, no sir. The redline is at 6,500 giri, but the engine will keep going to 7,400. And what an engine it is! Take the 3.8L V8 out of a Ferrari 488 GTB or California T, chop out a pair of cylinders, then turn up the boost. 505hp and it sounds amazing. The Quadrifoglio has plenty of carbon fiber, including the hood and roof. Alfa Romeo has been sticking the Quadrifoglio Verde badge on its raciest cars for a long time now. This is the Giulia Quadrifoglio’s grandfather, the 164. Back in the days before Alfa could raid the Ferrari engine shop, it used to make some of the prettiest motors to look at in the business. Chopping two cylinders out of the F154 doesn’t seem to have done it any harm. The engine has a peak power output of 505hp (377kW) at 6,500 rpm and a typically turbocharged torque curve that’s flat at 443lb-ft (600Nm) between 2,500 and 5,500rpm. And while the tachometer redlines at 6,500rpm, the engine will actually keep going for another 900rpm. The extensive use of aluminum in the chassis and suspension keeps weight down to around 3,360lb (1,524kg). 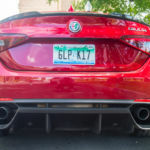 That’s split 50:50 over the front and rear axles for better handling, and Alfa claims a class-leading almost seven lbs:hp power-to-weight ratio. All of the Alfa’s technogubbins are wrapped up into our eyes at leasta stunning exterior. Alfa hasn’t been stingy with the carbon fiber. The Quadrifoglio’s hood and roof are both carbon fiber, and you can even see the naked weave of the former underneath the cowl when you’re sitting in either front seat. Naked carbon fiber also adorns the front splitter, the rear spoiler, and the side sills. You detect more Ferrari influence in the aerodynamics of the Quadrifoglio. It’s not just the scoops and ducts that adorn the front bumper and hoodthat carbon front splitter (which drops down at speed and generates 220lbs of downforce at the front) and that rather hefty rear diffuser at the back have some Ferrari DNA, too. OK, that’s enough with the technical specs and the re-writing of Alfa’s press kit. 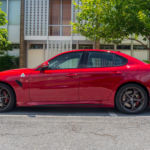 What you really want to know is why you should care about the Giulia Quadrifoglio, and care about it you should if you like fast, practical cars that sound amazing, look the business, and drive well. Don’t get me wrongthe car is not perfect. 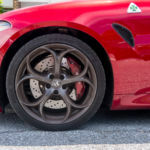 In fact, as you’ll see in the video, the Quadrifoglio has plenty of little flaws here and there. But this car truly is more than the sum of its parts. Climb in through the door and drop yourself into the driver’s seat. At first, you find you’re sitting much too far back in the chassis, but that fixes itself with a push of the big red start button on the steering wheel. Soon, the dials flair to life and the seat moves itself closer to the pedals and wheel. A quick look around the cabin reveals a few things. The design theme is more than a little Ferrari-like; from the contrast stitching, circular air vents, and lashings of carbon fiber, to the hooded instrument binnacles, massive aluminum shift paddles, and that narrow (carbon fiber) steering wheel rim. With the engine running, you’ll also notice something elseyour seat vibrates. With the engine on and ticking over, the entire car fizzes with excitement. Now, if you were an engineer from BMW or Mercedes or Cadillac, you’d call this NVH (noise, vibration, and harshness), and you’d add dampers and bushings and change engine mounts and so on until that all went away. But the folks at Alfa rightly saw this as proof of the car’s character and left it well alone. Good for them! Once you’ve selected a gear and are on the move, another thing quickly becomes apparent. There’s tons of feel through the steering, which is extremely quick and directanother recent Ferrari trait. 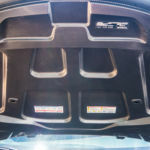 It’s not a variable ratio system, just good old-fashioned rack and pinion, although the amount of electrical assist you get varies depending upon the mode you’re in, of which there are four. 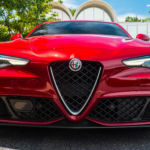 As with all Alfas of late, the Quadrifoglio has a dial next to the gear lever marked “DNA.” “A” stands for “Advanced Efficiency,” which in the Quadrifoglio means that the car can shut off ignition to one of the two banks of cylinders when you’re cruising. It’s useful for increased fuel efficiency during boring freeway drives. When coupled with the stop-start system, you might even see as high as 30mpg on long trips at reasonable speeds. That’s better than the EPA figure of 24 highway, but it also requires plenty of self-control. “N” is for “normal,” and this car does normal well. Even though the Pirelli PZero Corsa runs on 19-inch wheels and low-profile, ultra-high performance Pirelli PZero Corsa tires (245/35 at the front, 285/30 at the rear), it rides remarkably well over broken city streets. The ride is on the firm side, but body roll is never an issue. 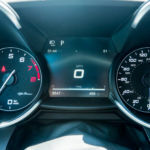 Still, a note of cautionthe stop-start system can stymie your attempts to go for a quick gap in traffic, as there are a few hundred milliseconds of lag between poking the accelerator pedal and actually moving forward. Interestingly, when the Quadrifoglio shuts the engine off in traffic, it also enables the steering lock, which is unlike any other car we’ve driven. Cheaper than its rivals from BMW, Mercedes-Benz, and Cadillac, the Quadrifoglio is quicker than they are around the Nrburgring, too. Massive six-piston front brakes. Carbon ceramics are available as an option. The rear spoiler is also made from carbon fiber. The interior is reminiscent of recent Ferraris. That’s a good thing. Unlike most other performance cars, the steering wheel rim is wonderfully thin. The steering itself is very direct and very communicative. And it’s not too adorned with switches and buttons, either. The flappy paddles are fixed to the steering column so they don’t move with the wheel. The gear lever looks a lot like the ones BMW fits to its cars, but it feels a little cheaper. If you’ve found this four leaf clover, you certainly are in luck.